The preliminary findings initially presented in this blog post were updated on September 20, 2018 to reflect the results published in the authors' new working paper. Ministers are gathering next week in New York at the United Nations’ High Level Political Forum to discuss progress being made on the Sustainable Development Goals (SDG). The goals are intentionally inspirational; promises made by all countries to their citizens to improve the prospects for people, planet, and prosperity. In recent research, we have been examining the SDG targets that squarely focus on measurable improvements in people’s lives—to ensure no one is left behind. We wanted to understand how many people the world is currently on track to help by 2030, and how many people the world is on a path to leave behind. Our study focuses on 21 “people-focused” SDG targets—those expressed in terms of measurable outcomes for a quantifiable number of people. Importantly, we distinguish between types of targets across two dimensions. First, we segment targets defined in absolute terms (e.g., ending extreme poverty, measured by a zero poverty headcount rate) from those defined in relative terms (e.g., cutting traffic deaths by half). Second, we distinguish between targets focused on “life and death” issues (e.g., child mortality, non-communicable disease mortality) and those focused on “basic needs” that are essential for a decent quality of life (e.g., proper nutrition, access to sanitation, gender equality of opportunity). We note that this approach is not able to address other important geography-based SDG environmental questions (e.g., climate change, oceans) or aggregation-based outcomes (e.g., Gini measures of inequality or economic growth). Our methodology allows us to estimate how each country and issue—and in turn the world—is doing compared to the ambitions enshrined in the SDG target. Below we describe three of the key findings so far. For each indicator, we estimate how many people are on course to have the relevant problem solved by the SDG deadline. Figure 1 shows the results for the basic needs indicators. The green portion of each horizontal bar represents the share of aggregate world progress by 2030 compared to a hypothetical baseline of no progress after 2015. Only four of these indicators—extreme poverty, access to electricity, malaria incidence, and Hepatitis B incidence, are on track to deliver at least half the needed progress and many are on track to deliver much less. A similar chart for life-and-death indicators (see report) shows that only child mortality is on track to cover more than half the distance to the goal. Meanwhile, the negative values in the bottom two bars of Figure 1 show that air pollution and children overweight are on track to worsen by 2030, requiring a turnaround to achieve the SDG vision. Another part of our analysis estimates how many lives and how many people’s needs are at stake today, as of mid-2018, when comparing the SDGs to recent trends. Figure 2 shows our best current estimate of the number of lives at stake on six indicators. On each issue, this is the difference between the cumulative number of deaths if recent country-level trends continue out to the SDG deadline and the number of deaths if each country achieves the relevant target. Overall, more than 44 million lives are at stake. 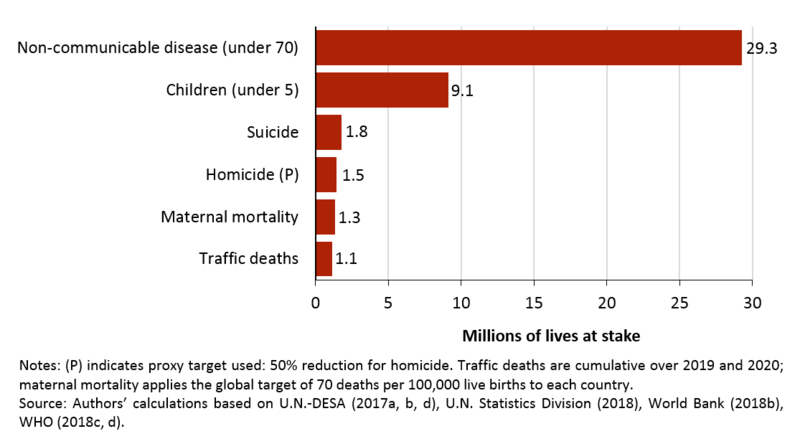 This is comprised of more than 29 million people under age 70 who will otherwise die from non-communicable diseases (mostly cardiovascular disease and cancer); more than 9 million children under-5 and 1 million mothers who will die of preventable causes; and more than 4 million people who will die of suicide, homicide, and traffic deaths. 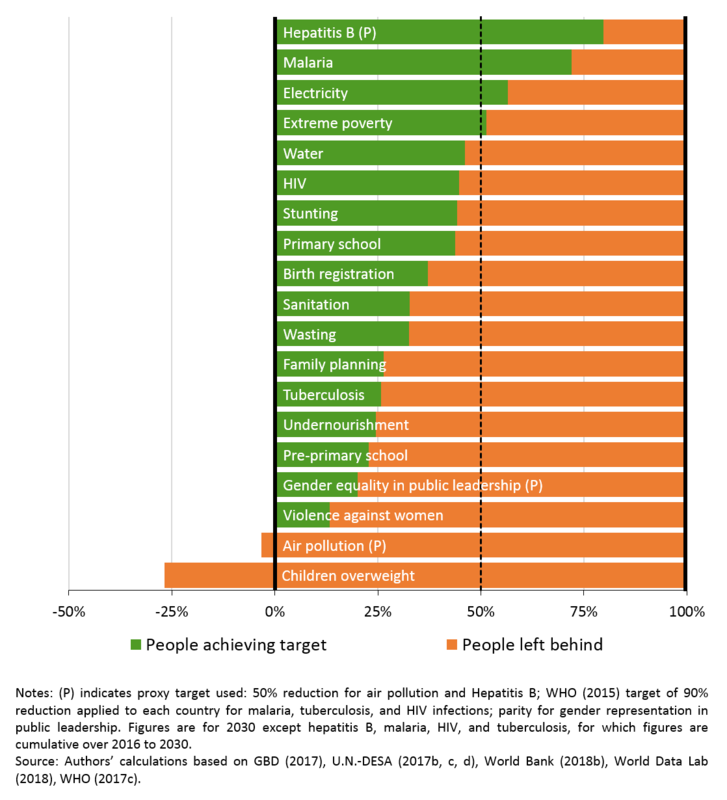 A corresponding chart for basic needs at stake (included in the report) shows that hundreds of millions of people’s basic needs are at stake on many indicators, and in some cases billions of people’s needs (e.g., for air pollution, sanitation, and gender equality in leadership opportunities). After considering the world’s trends on each indicator, we also examine how each country is doing on the same issues. This allows us to estimate, under current trends, which countries will still have the furthest distance to cover by 2030 on both the absolute and relative targets. It also allows us to estimate which countries are home to the largest number of people being left behind on each issue. Figure 3 shows the results for the absolute indicators. Red squares represent the “Top 5” countries on each indicator, i.e., the five largest concentrations of people on course to be left behind as of 2030. The number within each cell represents the implied share of the remaining problem: e.g., in the first column, Nigeria is on course to be home to 25 percent of the world’s remaining extreme poverty by 2030. The concentration of red cells at the top of the table accentuates the global concentration of extreme deprivation-related issues in a handful of populous countries. However, the dispersion of red squares across the matrix helps draw attention to a complementary truth: large numbers of people are being left behind across many countries on many issues. The United States, for example, ranks in the Top 5 for children overweight, lack of access to family planning, and lack of opportunity for women in public leadership. Our findings suggest that no country, at any level of average income, is on track to reach all the SDG targets by 2030. Everyone has problems that need to see faster progress. When SDG policy leaders gather in New York next week, there will undoubtedly be some sentiments of celebration. Amid a turbulent period in international cooperation, the SDGs have increasingly offered a ballast—a stable reference point helping more than 100 countries to report on their own common and collective policy challenges at the High Level Political Forum. In just the few years since 2015, the world has come a long way in forging a more outcome-oriented shared policy agenda. But our results show just how far the world still needs to go in order to deliver on that policy promise.